Moisturisers hold water in the skin and keep the outer layers plumped. As we age, the production of sebum, the skin's natural moisturizer, slows down and our skin starts to become drier. A moisturizer will help seal in the moisture keeping it soft and more youthful. Ideal under makeup, this lightly textured moisturizer protects and nourishes your skin. 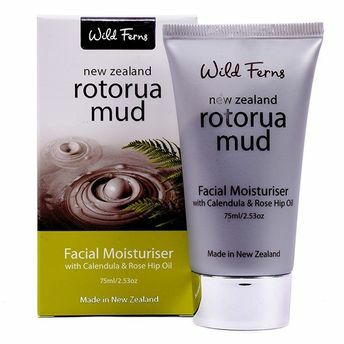 As well as containing therapeutic minerals and trace elements, geothermal mud from Rotorua is also hydrating and soothing. The addition of restorative Calendula for skin renewal and Rosehip Oil to fight ageing and sun damage further enhances the beneficial properties of this moisturizer.